The National Aeronaval Service — SENAN — claims to be Panama’s coast guard. We have an older and more ubiquitous force guarding the coasts. If we want to get into an argument over who is more upright and efficient there has to be a conversion table to compare payoffs of fish scraps to those of money. 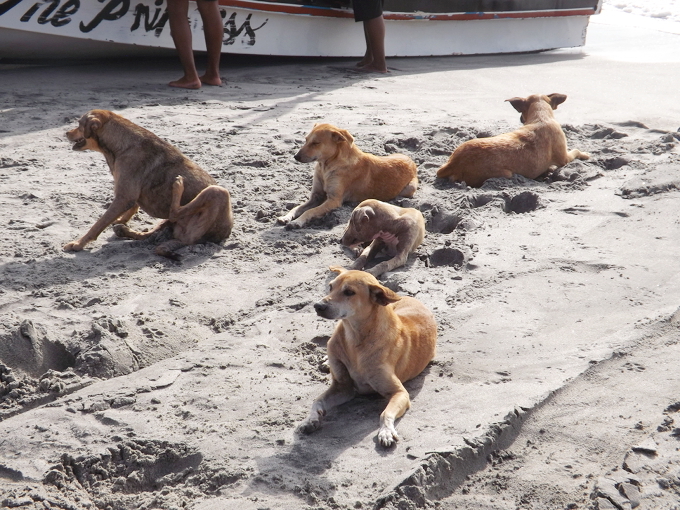 Panama’s fishing village dogs are a dying breed. It’s not that they are a breed of dog that some kennel club or geneticist would recognize as such, although in any given fishing village a lot of the members of the local dog pack will have similar appearances because they will be closely related to one another. It’s that Panama’s fisheries are declining. Mangrove swamps and coral reefs that serve as the incubators for the lower end of the coastal marine food chain are being degraded by the cutting of mangroves, by reefs being covered in plastic and other pollution and by climate changes that are causing coral species to die. The damage caused by such new arrivals as the lionfish is just gravy, but the biology and math of too many people trying to catch too few commercially valuable fish is central to the problem. Replanting mangroves, creating artificial coral reefs and oyster beds, building and operating hatcheries to raise schools of fingerlings to release into the sea — these are not rocket sciences. Nor is the regulation of fishing seasons, catches and methods in order to preserve fish stocks. The latter regulatory methods have been commonly practiced in Panama for many years, but the former ways of building and rebuilding the fisheries have not been. In communities where fishing has been a mainstay of the local economy since long before anybody living there was born, it has also been a long time since any politician had much to say about fishing as elections approached. Instead the monologue coming from developers or would-be developers is that the best economic use of Panama’s shorelines is for luxury condos to attract mostly imaginary foreigners. The developers and their acolytes will malign fishers as a criminal element that must be removed to make way for their private progress, and the politicians will deny that they harbor any hostility to or are doing anything to harm the interests of those who fish for a living. But all up and down the Pacific coast of Panama in particular, fishing villages have been razed to make way for developers. Under Panama’s constitution the beaches are public property and access to them may not be blocked, but with purported concessions that privatize the use of the beaches and armed guards to enforce those dubious claims the activity of fishing is being expelled from many beaches along with the village where people lived. Back along the shore, Panama’s laws about public beaches combine with climate change to the fishers’ disadvantage. The basic rule is that the public zone extends inland along a line parallel to the reach of the highest waters at the highest tides. But climate change has raised mean sea levels ever so slightly, and created more frequent storm surges and swells, such that the high water line is moving inland. The phenomenon is easily perceived. Before people noticed the change most fishing villages were already in the zone where land cannot be legally owned. With the change many of the houses became unlivable because of the frequency of the floods. The ever-higher waters also have also washed away some expensive resort investments along the shoreline. This writer got a kick out of seeing former President Martín Torrijos, who build a beach house on the sand, suffer property damage from the waves — served him right for ignoring the Biblical injunction about building on the sand. Do dogs understand any of this? Surely many of them know about having to move into the cities or to inland rural areas, or about being abandoned to their own devices by people who left them behind. There are ever fewer fishing villages and ever fewer fishing village dogs. Has it converted hardscrabble fishing village dogs into better fed dogs living with upscale new residents, some of them foreigners with different cultural outlooks on the human-canine relationship? Surely there are such adoptions, but the reality is that many of these new towers on the beaches are empty. In some cases there is speculation that they will eventually attract residents, but in others it’s a money laundering scheme. Some foreign racketeer — and they come from many criminal enterprises in many countries — buys a condo. Maybe it’s one that’s dubbed luxurious but is actually poorly built. It’s usually empty most of the time, sometimes all of the time. But back home the condo owner claims fabulous rental income from the investment and reports his or her drug money, or the proceeds of illegal currency transactions or whatever, to the taxman. Go by some of these completely sold condo towers at about eight in the evening and there will be hardly any lights on in the whole building. 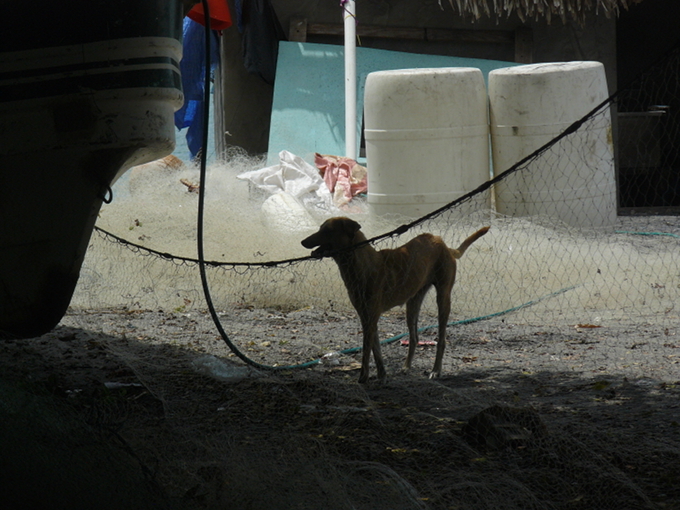 The bottom line for the fishing village dogs is that there isn’t somebody living in a new condo to adopt every dog who gets abandoned by fishers who are forced out. In a fishing village the dogs are not fenced or tied, but they do bond with particular human beings, have particular friends within the community of dogs, and make sure to be around when the boats come in and they might get a little fish, some offal or the remains of a fish that has been filleted. By many standards fishing village dogs eat well. However, small-time fishing is not a lucrative business. Are there some who bring in money from smuggling or other activities on the side? Certainly there is an underworld element to the fishing scene, but then the poorest elements of that economy are the most expendable to both law enforcement and crime bosses. Look for the trawler that comes and goes at a dock rather than a boat that is parked on a beach between high tides to be carrying the drugs. Look for the purported island resort developer who sends out a boat with a six-person work crew in the morning and receives a dozen people returning from work in that same vessel for the smugglers of migrants without visas. The real opportunity for fishing villagers to smuggle is to hire their boats out as lighters that surreptitiously bring things ashore from larger vessels. 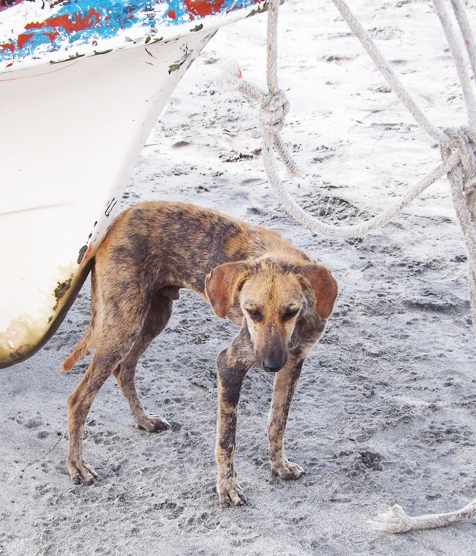 In any case, fishers tend to be poor to the extent that they often don’t have the resources to take care of their own health needs, let alone those of the dogs with whom they share the beach. 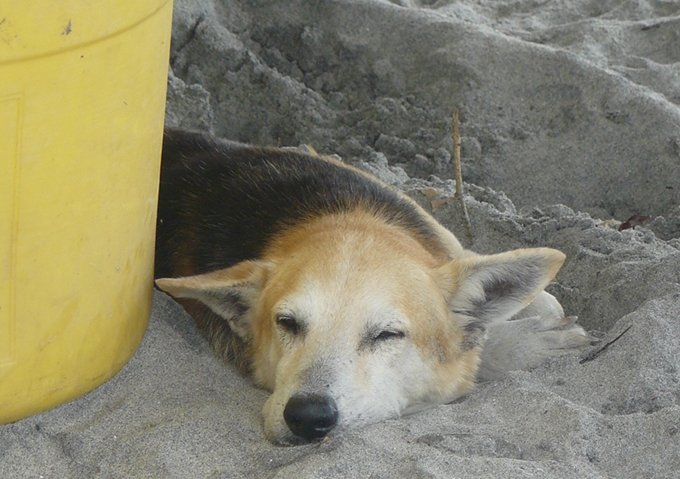 For both fishers and dogs, it’s a hardscrabble life on the beach. Might we some day get business people who understand that their resort or residential project just uphill from the high water mark will be more attractive if potential buyers and guests can buy fresh seafood from the fishing boats on the beach? Might we some day get political leaders possessed of a sense of national security that holds that the cornerstone of a nation’s safety is its ability to feed itself and knowing that Panama has lived by fishing and farming for at least 10,000 years? Then we might have less precarious and more honorable social and physical places for those who fish, and for their loyal four-legged friends. Do the dogs along the Pacific Coast of the Americas have a communications system that starts in Tierra del Fuego and ends up on the northern shore of Alaska, or vice versa? 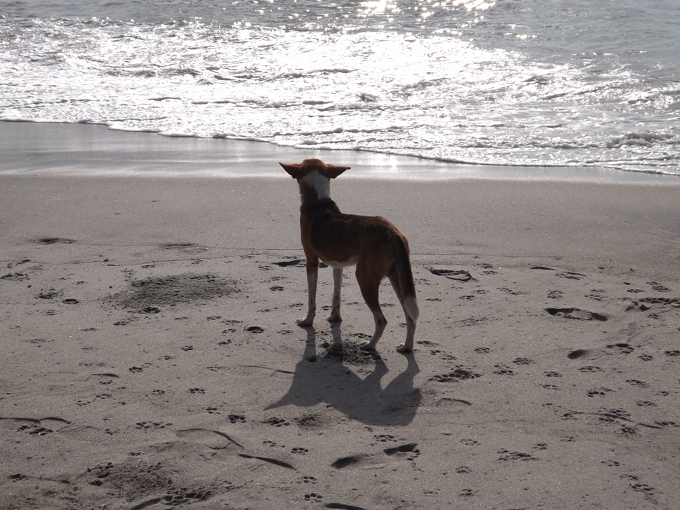 No such thing has yet been documented, but dogs barking and howling on the beach. setting off other dogs farther up or down the coast, are a frequently observable fact. People probably don’t know the extent of it because dogs have so much better hearing than we do. It’s high tide, the boats are coming in and this pack knows that this means that they are about to be fed. There are boats and nets and other fishing tackle to defend. 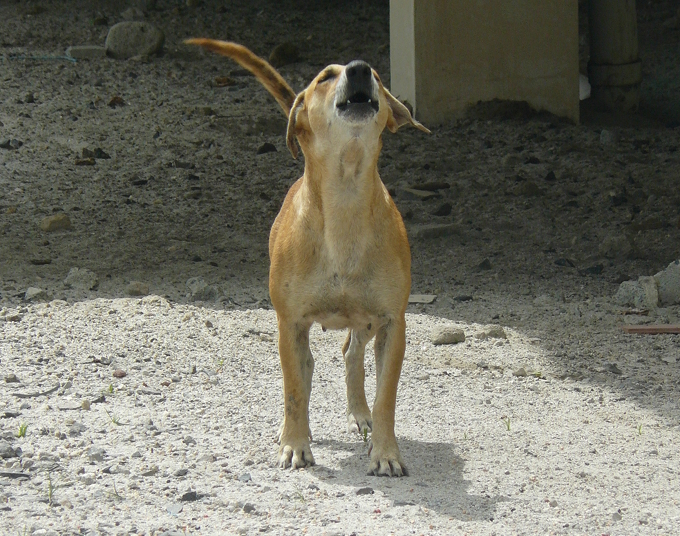 Mange and other ordinary dog diseases can be treated, but often in the fishing villages they are not. 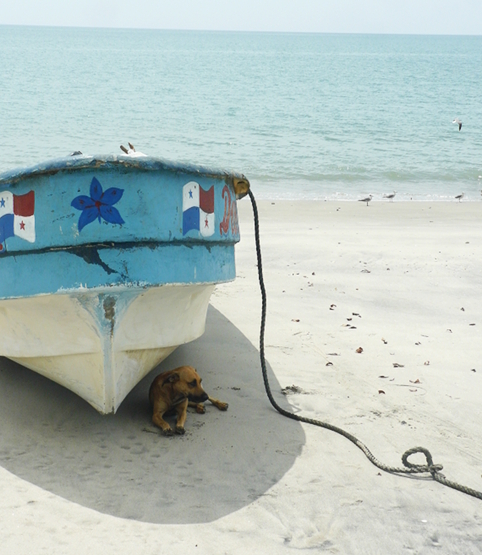 Shelter from the tropical sun is often an existential issue for Panamanian fishing village dogs. If there is protection from the sun or rain, the sand can make quite comfortable bedding for a dog.